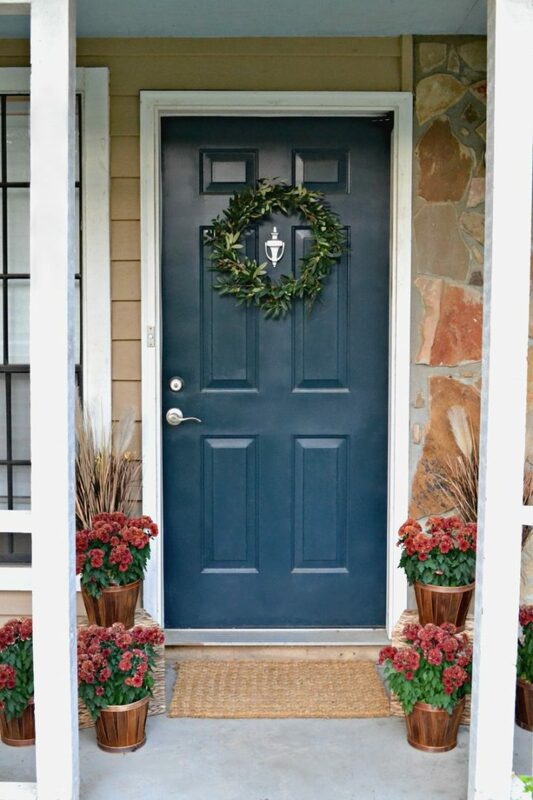 Hey there friends, and welcome visitors for the Fabulous Fall Home Tour! So, usually, my big transition into fall mostly just involves switching from white to red… wine. But, as I mentioned last week, things seemed to align just right where I had an afternoon to go grab some flowers and other items while I was out and just have fun with fall for a minute. Perhaps it’s that I knew I’d be out earlier this week for a sponsored event and wanted to do something that required a different part of my brain (chainsaws and cutting concrete and throwing stuff, oh my — but it was so much fun and I you should see me throw at a target with an axe). Or, perhaps it was simply that my sister was coming over last weekend for dinner. Since I hardly have her over, it seemed only right to decorate a little. 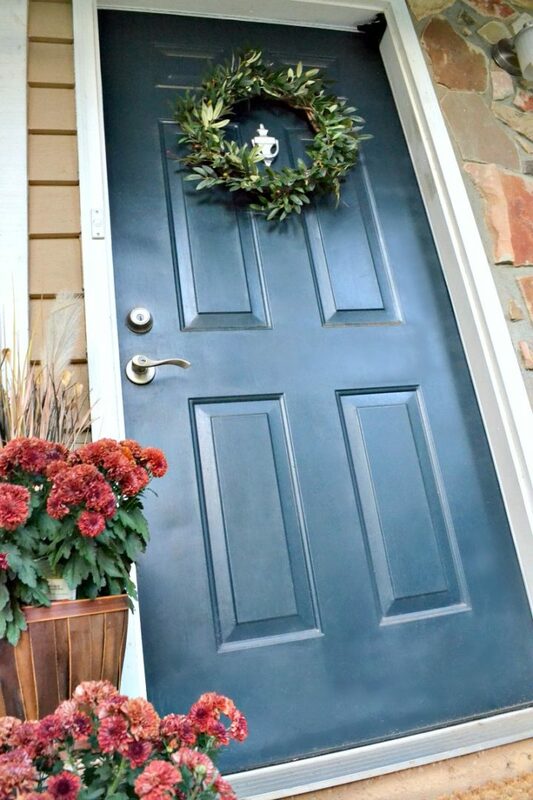 Whatever the inspiration, it stuck, and here I am with an actual fall home tour! 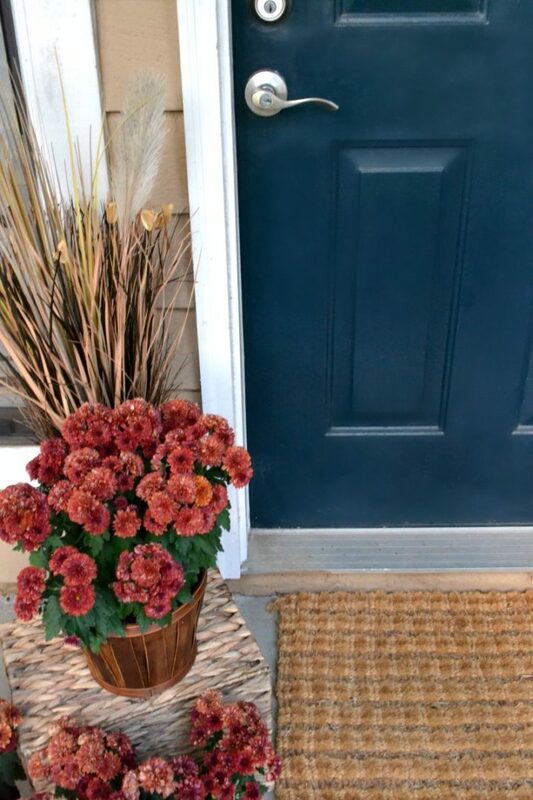 Let’s start with the front door and porch: I didn’t really plan to decorate with any traditional fall colors, but I found a bunch of red mums on clearance and they seemed too good to pass up ($3 each). 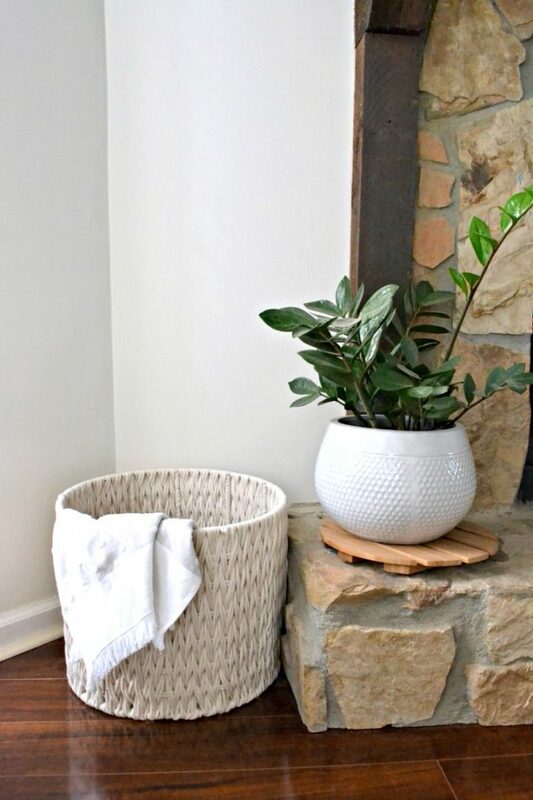 Combined with some storage baskets I had on hand and tall dried bunches of who-knows-what (confession: I don’t read the descriptions on the decorations I buy… I just look for something that looks fall-ish and go with it), it all seemed to work well with an olive wreath I picked up from Amazon. 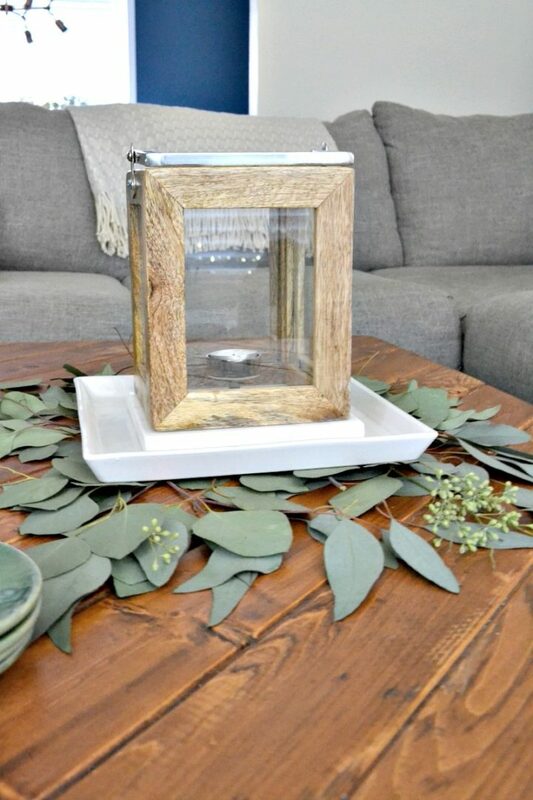 In the living room, I added a few more cozy blankets to the new sectional, added another storage basket underneath the coffee table, and spread out some inexpensive leaves under a wooden lantern (similar). I also switched out Charlie’s toy basket for something that looked almost sweater-like (the rope pattern reminds me of winter textiles). I didn’t want to do a big huge push to make everything match since I am never that coordinated, but I was also cleaning up a water spill from the pup and the extra hand towel just looked nice draped on the edge. Lemons –> lemonade. 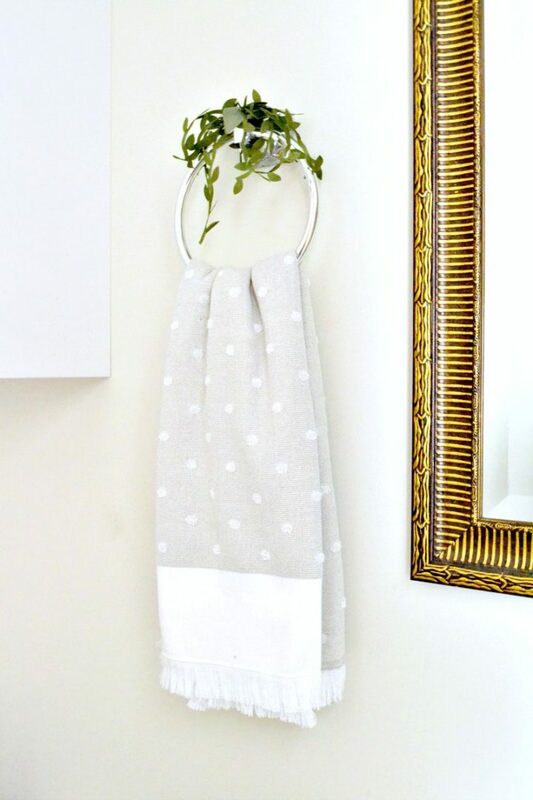 I buy hand towels in sets (like every person ever, probably), so the matching one went into the hallway bathroom; I say this mainly because I didn’t want you guys thinking I walked across the living room to put Charlie’s slobber towel in the bathroom towel holder! One of the things I’ve learned from my sister (who loves every holiday and decorates for each) is that when it comes to seasonal decorating, pretty much anything is fair game, including the bathroom. And if you feel like just one touch to the room is enough, then go for it! 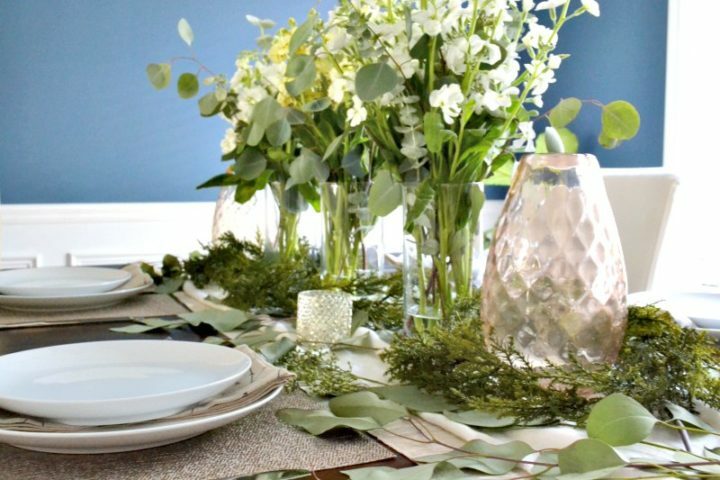 Finally, in the dining room, I added more flowers, more greenery, and began setting up the table for dinner the next night. I’ll admit, I basically overdid it (I may or may not have been playing with some of my Christmas decor simultaneously), but I still liked the end result — blame the $2.99 flowers at Trader Joe’s. 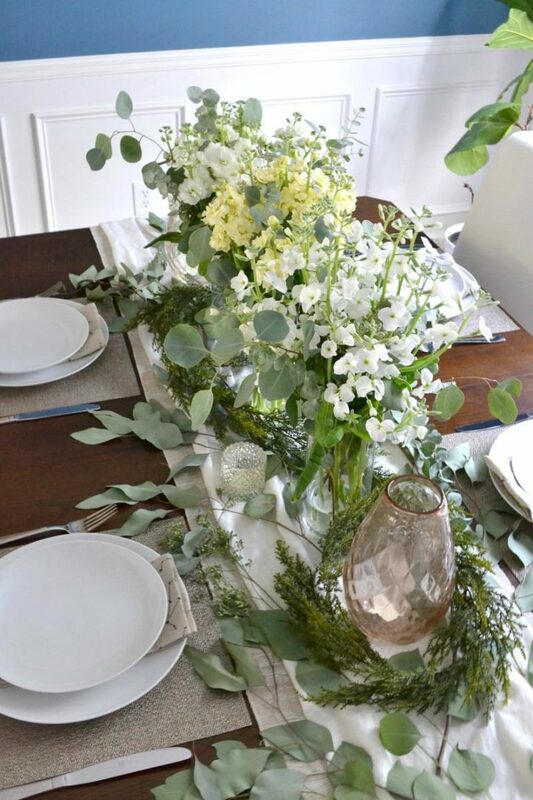 Because the room is such a vibrant color on the walls, I like to go with more neutrals, and the white/soft green combo is of course a favorite of mine. The rose-colored candle holders on either end were on clearance from Joann’s. 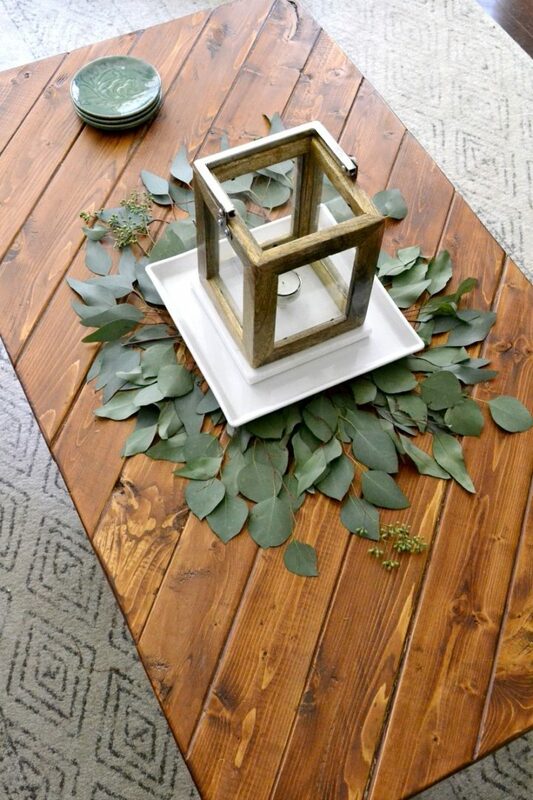 I like to add metallics when I decorate no matter the season, so a few holiday standards were also thrown in (like the smaller mercury glass candle holders and placemats). I also added in some linen constellation napkins (these are OLD, so here is a similar version). They were a big hit with my nerdy boyfriend. 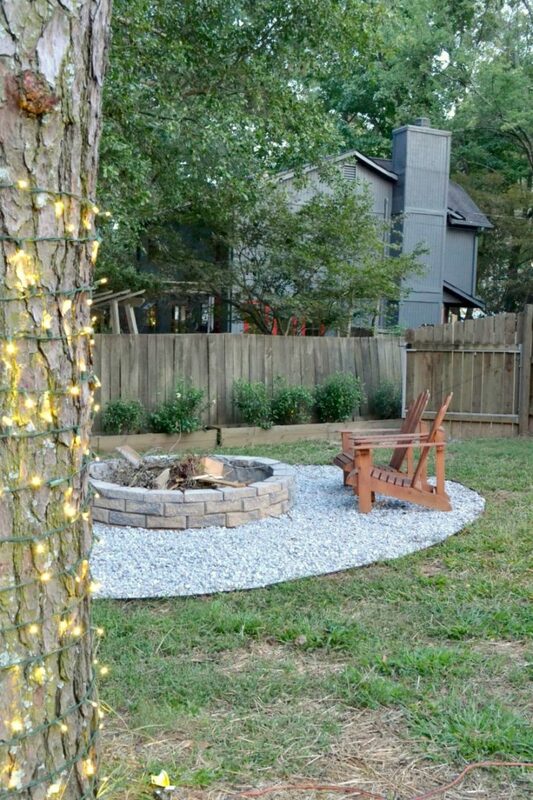 For me though, the biggest update in the house to signify the season’s change is still the new fire pit. Nothing says fall to me quite as much as the ability to have really amazing s’mores (and to be honest, I like that it makes the house smell like a bonfire). So, that’s pretty much how I welcomed fall this year at the UDH. Oh! And one more item: any big cross-stitching fans out there? I cross-stitched a fall tree using my own pattern and just finished that up as of last night. I am writing all the details on how I create my own designs, so if you’re interested, subscribe here to get notification on that post next week (I’ll have a free download for the pattern as well). 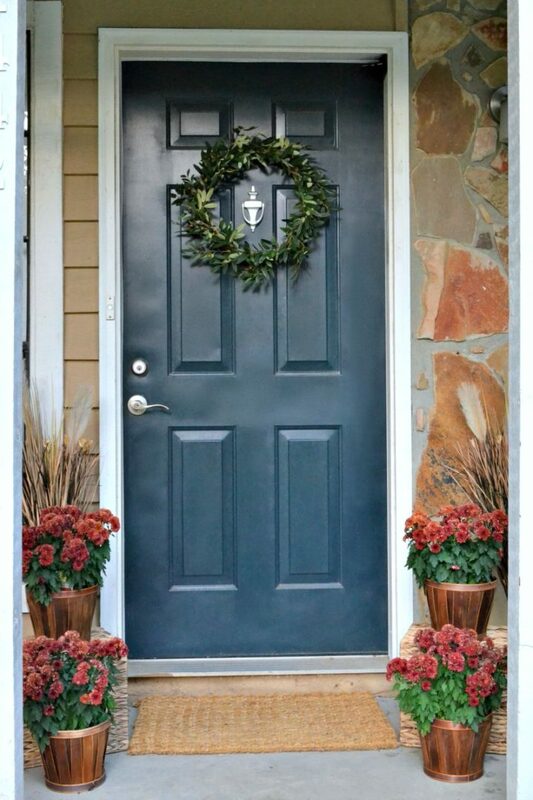 Are you decorating for fall this year? Also, don’t forget: this is a blog hop, so check out the others in the tour! 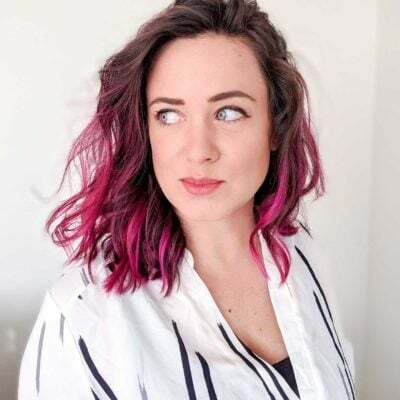 Brittany from Pretty Handy Girl is hosting, and here is the full list! 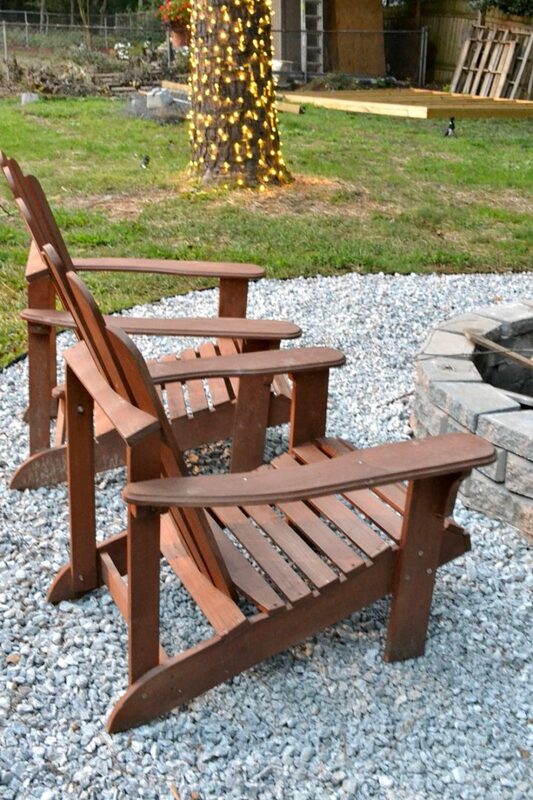 GAHHHHH that fire pit! And i LOVE your cross sittch! 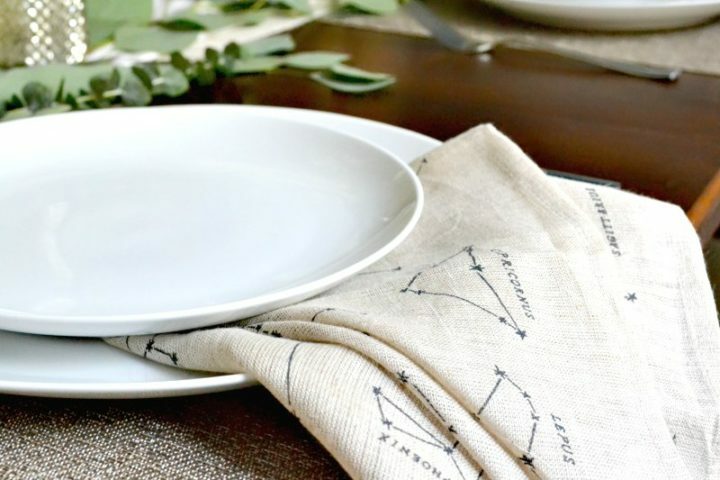 Those constellation napkins deserve an incredible meal to go to work for! LOVE em and may I ask where you got those? Your house looks beautiful Sarah! Laughing out loud over the hand towel explanation. 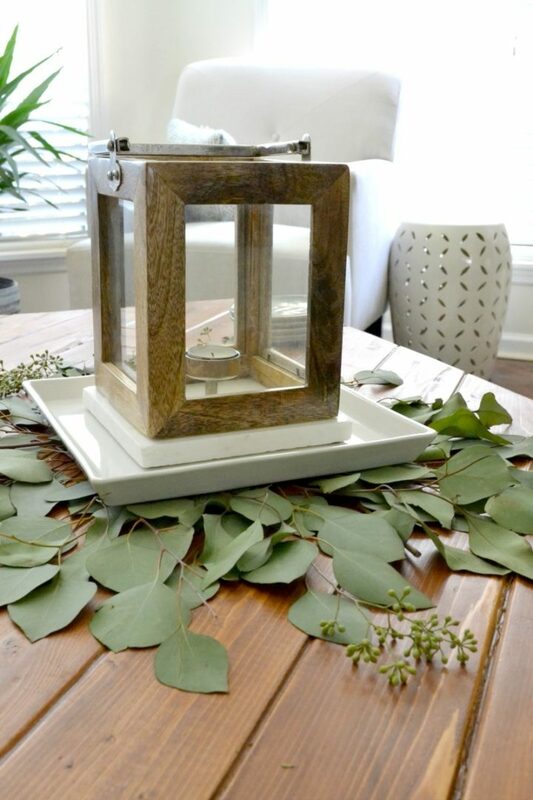 BTW, I’m jealous that you scored some seeded eucalyptus. I have a hard time finding any. Trader Joes! I’m thinking of doing a post just on those bunches by itself. Great job! 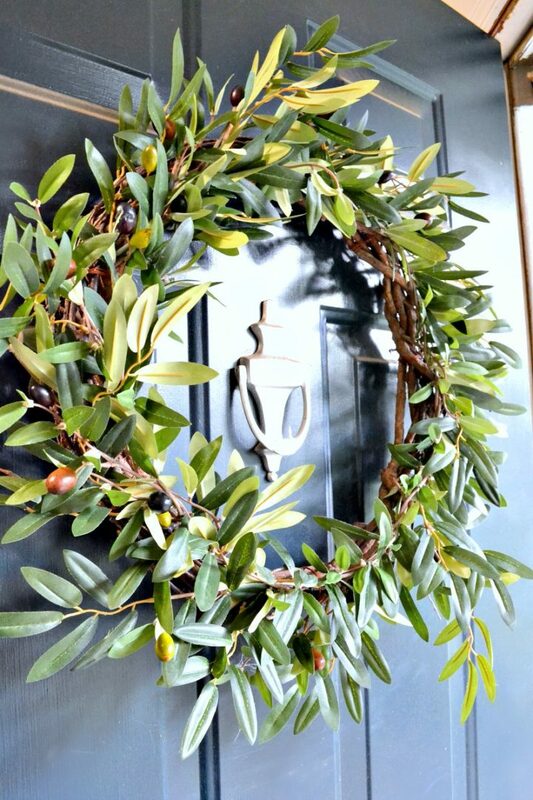 That olive wreath is beautiful. I cross-stitch, but haven’t designed my own. Ha! You crack me up! 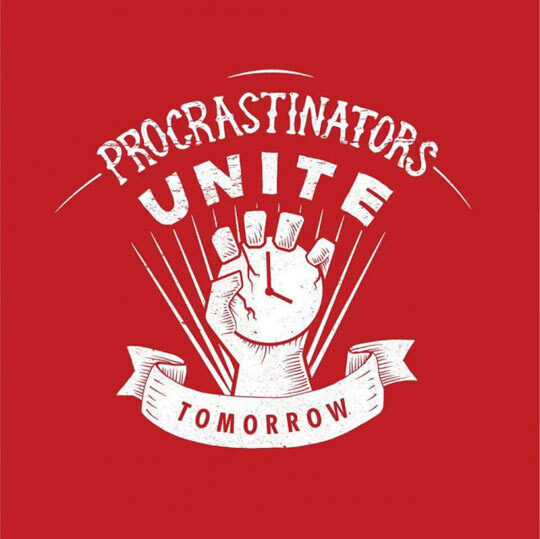 Procrastinators unite, tomorrow…LOVE it. The house looks great for fall! 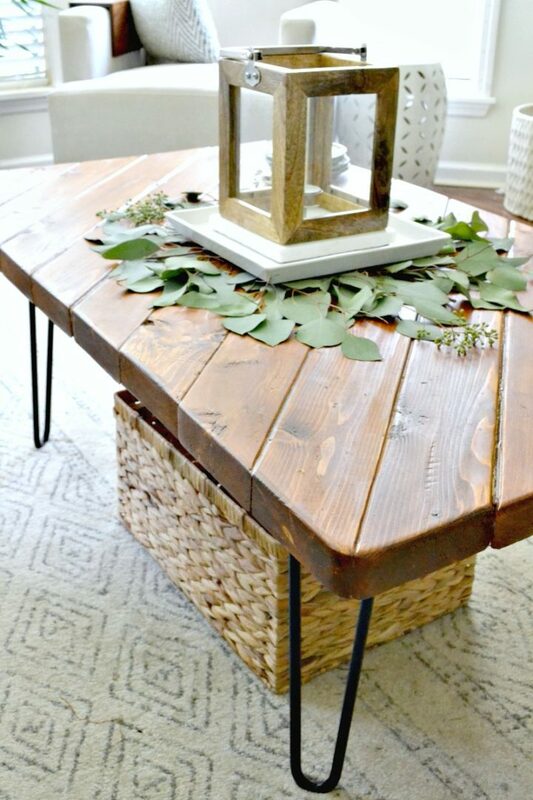 Love the porch!! And your cross stitch is lovely! Universal truth about fire pits (and bonfire hair) signifying all things fall! 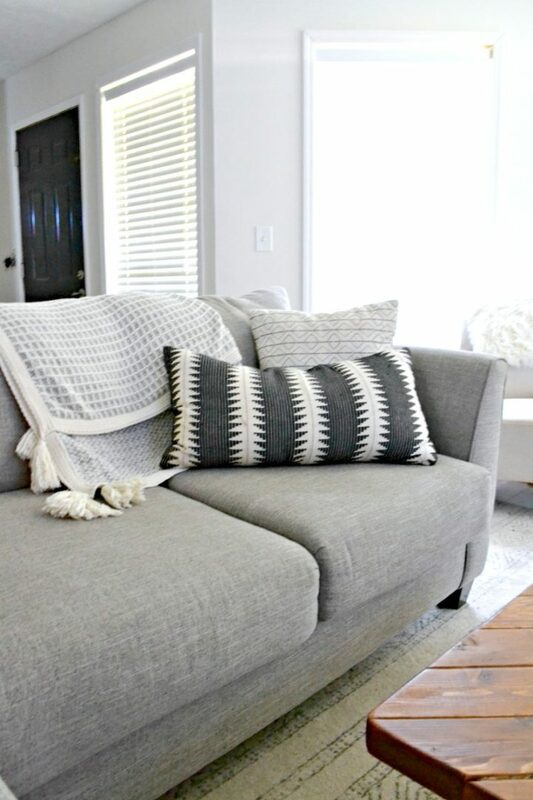 Loved this post and your fall cross stitch! 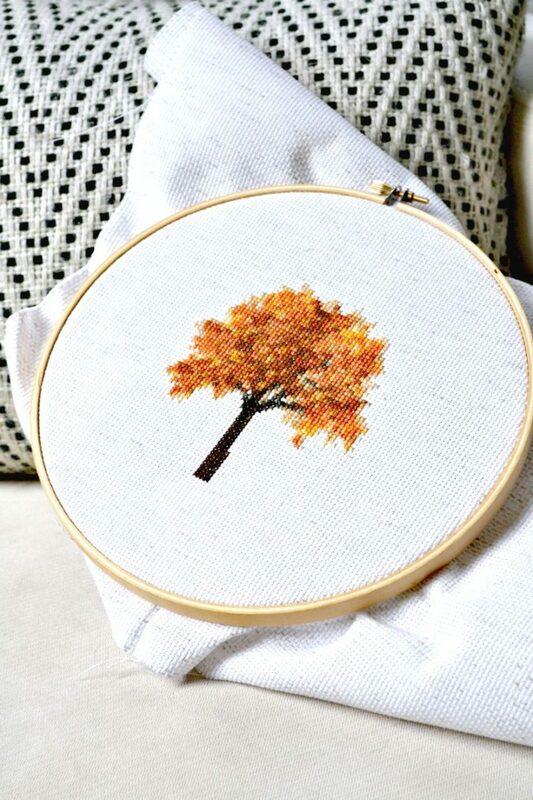 That color palette in your stitching is absolutely perfect, for a tree with fall color! I couldn’t not comment! Awesome!!! Darn it! Now I have to get back into cross stitch! Your little tree is so pretty! I love how you’ve decorated! Thank you! And yes, join us! I’m pretty sure Jaime is a stitcher too. I want to get a roundup going sometime within the next few months if you’re interested!